Among antioxidant enzymes, the superoxide dismutase (SOD) family is a major actor in catalysing the disproportionation of superoxide. Apart from its role as antioxidant, these enzymes have a role in cell signalling, and Cu,Zn-SOD proteins are also major pollen allergens. In order to deepen our understanding of the SOD isoenzymes present in olive pollen and to analyse the molecular variability of the pollen Cu,Zn-SOD family, we carried out biochemical, transcriptomic and localization studies of pollen grains from different olive cultivars and other allergenic species. Olive pollen showed a high rate of total SOD activity in all cultivars assayed, which did not correlate with pollen viability. Mass spectrometry analysis together with activity assays and Western blotting experiments enabled us to identify new forms of Cu,Zn-SOD enzyme (including chloroplastidic and peroxisomal forms) as well as differentially expressed Mn-, Fe- and Cu,Zn-SOD isoenzymes among the pollen of different olive cultivars and allergenic species. Ultrastructural localization of Cu,Zn-SOD revealed its plastidial localization in the pollen grain. We also identified the occurrence of a shorter form of one of the cytosolic Cu,Zn-SOD enzymes, likely as the result of alternative splicing. This shorter enzyme showed lower SOD activity as compared to the full length form. The presence of multiple SOD isoenzymes in the olive pollen could be related to the need of finely tuning the ROS metabolism during the transition from its quiescent condition at maturity to a highly metabolically active state at germination. Approximately 1% of O2 consumed by plants is diverted to produce reactive oxygen species (ROS) at various subcellular loci . Reactive oxygen species is a term that encompasses the hydroxyl radical (HO. ), hydrogen peroxide (H2O2), the superoxide radical (O2.-) and singlet oxygen (1O2). In the plant kingdom, while ROS production and ROS-induced damage occur under biotic and abiotic stress conditions, ROS are also associated with molecular signalling [2–5]. In higher plants, enhanced oxidation is also a signal for appropriate adjustments in gene expression and cell structure in response to environmental and developmental cues . There is a close relationship between ROS (particularly H2O2) and plant reproductive biology. Pollen tube growth has high-energy requirements, and ROS result from aerobic metabolism. Furthermore, pollen tube growth is guided through the pistil thanks to the interchange of signals between pollen and pistil tissues, a process in which ROS appear to participate as signals. Reactive oxygen species, mainly H2O2, are constitutively accumulated in stigmas, and high levels of peroxidase activity have been detected when mature stigmas are receptive to pollen grains . Their accumulation in stigmas is related to nitric oxide (NO) production in pollen grains , which seems to negatively modulate H2O2 when pollen grains stick to stigmatic papillae [7–9]. Moreover, a clear association has been established between ROS and the oscillatory cycles of pollen tube growth in lily . Levels of ROS in cells are controlled by a vast gene network . These ROS are produced during metabolic processes and stress conditions, and they are decreased by a broad antioxidant system. Antioxidants can be non-enzymatic, including ascorbic acid, tocopherol, glutathione, flavonoids, alkaloids and carotenoids . The enzymatic antioxidant system is composed of superoxide dismutase (SOD), catalase (CAT), peroxidase (POD) and the ascorbate-glutathione cycle enzymes , among others. The SOD family catalyses the disproportionation of superoxide (O2 ·- ) radicals in biological systems to form H2O2 and O2 , which plays an important role in protecting cells against the toxic effects of superoxide radicals produced in different cellular compartments. Plant SODs are metalloenzymes containing Fe, Mn or Cu/Zn as prosthetic group. The number, type and distribution of SOD isoenzymes can change depending on the species, developmental stage and environmental conditions [15–19]. Iron-SODs, likely the oldest group of SODs , are ubiquitous enzymes in plants , being inactivated by H2O2 but resistant to KCN inhibition. A first group of Fe-SODs consists of a homodimer formed by two identical 20 kDa subunits, with one or two Fe atoms in the active centre. A second Fe-SOD group, found in most higher plants, is a tetramer of 80–90 kDa and contains two to four Fe atoms in the active centre . Fe-SODs have been found mainly in chloroplasts , and more rarely in mitochondria and peroxisomes [22, 23]. Manganese-SODs are functional homodimers and homotetramers composed of 23 kDa subunits . They are not inhibited by cyanide or H2O2, being present in mitochondria and peroxisomes [16, 25–27]. The Mn-SOD gene is expressed in all cell types and is the only SOD present in vascular tissues . Copper,Zinc-SODs are ubiquitous and very stable homodimeric enzymes of about 32 kDa . Each subunit contains a Cu atom involved in the dismutation reaction, and a Zn atom that stabilizes the enzyme in order to maintain an appropriate level of catalytic activity and to catalyse the folding of SOD in the physiological buffer [28–30]. This enzyme is reversibly inhibited by cyanide and H2O2 at concentrations ≥10 μM . Copper/zinc-SODs are located in the cytosol, chloroplasts, peroxisomes and the apoplast [32–39]. Chloroplast Cu,Zn-SOD sequences contain 153 amino acids, with the terminal one being Leu, Ile or Val, while cytosolic isoenzymes are 152 amino acids long, with the last one always being a Gly . Previous work reported up to four Cu,Zn-SOD forms of ~ 16 kDa and pIs ranged from 5.1 to 6.5 in the olive pollen, which localized in the cytoplasm of both the vegetative and generative cells  and in peroxisomes . Olive pollen Cu,Zn-SOD is also an allergen, with an incidence in the population of 35% . Molecular variability of this allergen in olive pollen was assessed by bioinformatics approaches using an olive pollen transcriptome and further PCR validation . In the present study, we gain a deeper understanding of the different SOD isoenzymes present in olive pollen and reveal the presence of new SOD forms. We also analyse the molecular variability of Cu,Zn-SODs in several cultivars and discuss the importance of this variability in relation to reproductive biology and allergy. SOD activity in pollen was higher as compared to other olive tissues such as leaves, which showed rates of 1.7 U/mg protein . 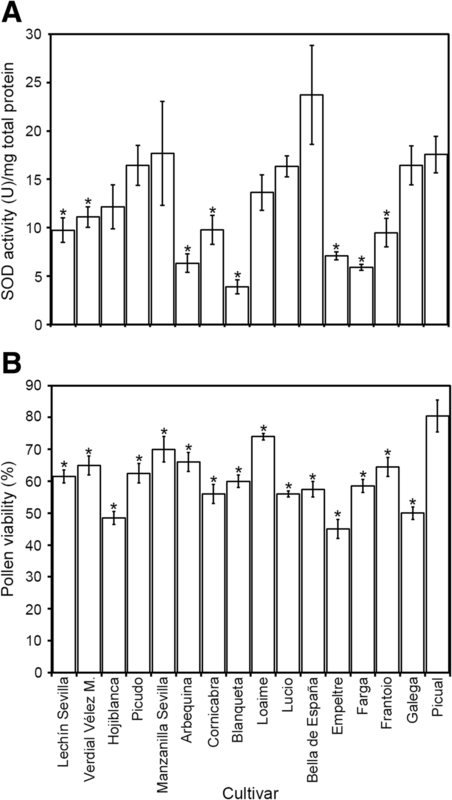 Olive pollen protein extracts displayed very different total SOD activities depending on the cultivar (F = 26.648, p = 0.000). Thus, total SOD activity ranged from 3.9 (cv. ‘Blanqueta’) to 23.7 (‘Bella de España’) U/mg of total protein (Fig. 1a). Taking ‘Picual’ as the reference cultivar, eight other varieties (‘Lechín’, ‘Verdial’, ‘Arbequina’, ‘Cornicabra’, ‘Blanqueta’, ‘Empeltre’, ‘Farga’ and ‘Frantoio’) showed significant lower activity levels, while the remaining cultivars tested showed similar values (Fig. 1a). Given that pollen viability may change depending on the cultivar and environmental conditions, we also detected differences in this parameter among cultivars (F = 46.868, p = 0.000). All the cultivars analysed showed lower viability values compared with ‘Picual’ (Fig. 1b). However, no correlation was found when comparing total SOD activity and pollen viability (r = 0.177, p = 0.228). Distinctive SOD activity band profiles were also observed in native gels depending on the cultivar (Fig. 2a). The presence of Mn-SOD and Cu,Zn-SOD isoenzymes was confirmed by nanoLC-ESI-MS/MS analysis of excised bands from SOD activity gels (cv ‘Picual’). Thus, bands I and III matched with Mn-SOD enzymes, while Cu,Zn-SODs were identified in bands II, IV and VII (see Additional file 1: Table S1). Bands V and VI did not give any positive match in the MS/MS analysis. These data are in good agreement with our results here since transcripts of four distinct cytosolic Cu,Zn-SODs were also identified in the olive pollen transcriptome (Table 1). MS band assignments were also assessed by inhibition assays (Fig. 2b, c). We identified a variable number of Cu/Zn-, Mn-, and Fe-SODs in the olive pollen extracts of all cultivars tested. Interestingly, Mn-SOD activity was found to be significantly higher than either Cu,Zn- or Fe-SOD activities on acrylamide gels. A common pattern of seven bands was observed in most of the cultivars. The upper band (I) corresponded to a Mn-SOD, which was absent in ‘Bella de España’. Bands II and III corresponded to a Cu,Zn- and Mn-SODs, respectively, and were present in all cultivars. Band IV was recognized as a Cu,Zn-SOD and appeared only in ‘Picudo’ and ‘Picual’. Band V was identified as a Fe-SOD in all cultivars. Finally, bands VI and VII also corresponded to Cu,Zn-SODs, which were differentially expressed among cultivars. Accordingly, band VI was displayed in cvs. ‘Verdial de Vélez Málaga’, ‘Farga’, and ‘Frantoio’, whereas band VII was present in all cultivars, except ‘Empeltre’ and ‘Galega’. Marked differences in pollen protein profiles were visible in Coomassie-stained 1-D gels among 16 olive cultivars, mainly in relation to a 18–20 kDa band cluster, which correspond to the major olive pollen allergen Ole e 1 (Fig. 3a) according to previous work carried out by the present authors. 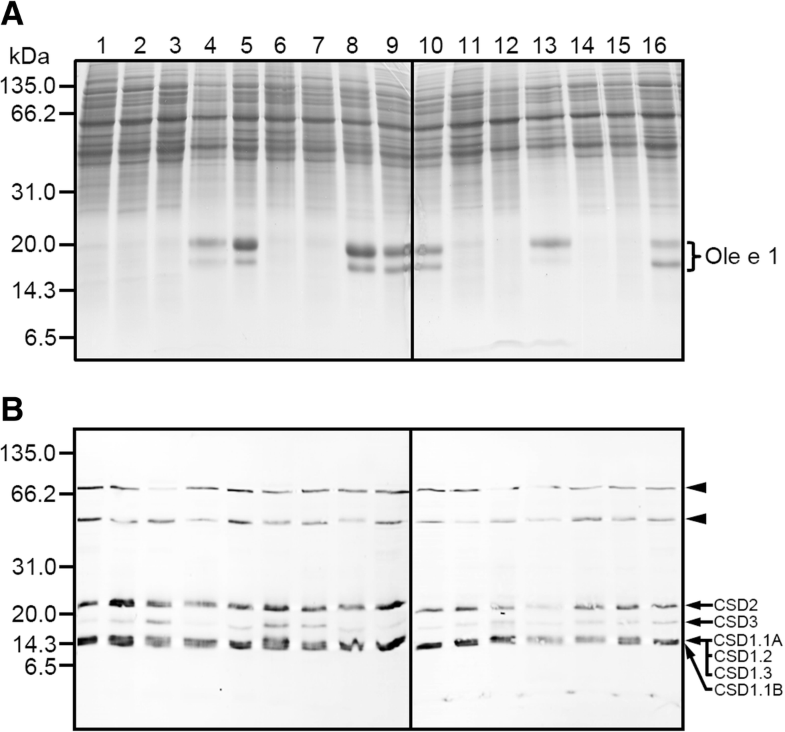 The corresponding immunoblot probed using an anti-CSD2 antibody revealed up to six different bands in all the extracts, with molecular weights of approximately 72.0, 54.0, 23.5, 16.0, 15.3 and 14.5 kDa (Fig. 3b). On the basis of their theoretical molecular weights, the 23.5 and 16.0 kDa bands likely correspond to chloroplastidic and peroxisomal forms of the Cu,Zn-SOD enzyme (named OeCSD2 and OeCSD3, respectively, after comparison with their Arabidopsis orthologues described in the TAIR database: www.arabidopsis.org). Moreover, the 15.3 kDa band might group the cytosolic OeCSD1.1A, OeCSD1.2 and OeCSD1.3 forms, while the 14.5 kDa band can be matched to the OeCSD1.1B enzyme (all these forms also named according to the Arabidopsis orthologues present in the TAIR database). As with 1D, the 2-D gels of whole protein extracts from the olive cultivars ‘Picual’ also exhibited well-represented spots of Ole e 1. 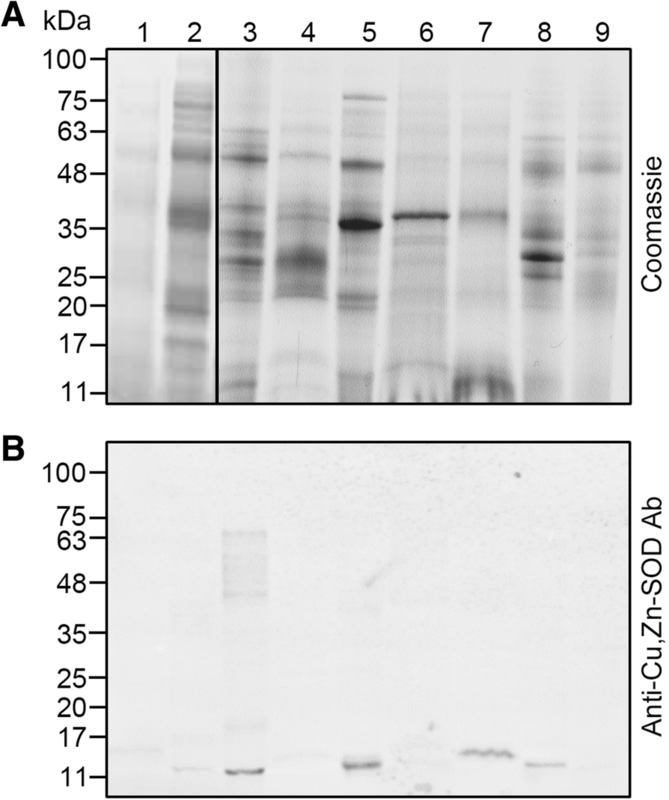 After probing the corresponding immunoblot with the Cu,Zn-SOD antibody, different spots with molecular weights of approximately 15, 22, 32, 40 and 60 KDa showed reactivity to the antibody. The overlapping of gel-immunoblotting pictures enabled us to identify the localization of the spots assigned to Cu,Zn-SODs in the 2-D gels of olive pollen extracts after Flamingo staining. The distribution of the immunoreactive spots showed the presence of several isozymes with Ips focused along the whole membrane, which were assigned to putative cytosolic, peroxisomal and plastidial monomeric Cu,Zn-SOD forms, respectively according to the same criteria applying for 1-DE. Several other cross-reactive proteins were not be assigned (see Additional file 2: Figure S1). In order to assess whether the observed high molecular weight bands might correspond to multimeric forms of the Cu,Zn-SOD enzymes, we developed new assays by incubating pollen extracts with a panel of reducing and/or denaturing agents, prior to SDS-PAGE and immunoblotting (Fig. 4a). A similar band pattern to that reported with the anti-CSD2 Ab was obtained when probing an anti-olive pollen Cu,Zn-SOD Ab either in 1-D (Fig. 4b) or 2-D (see Additional file 2: Figure S1) blots. In addition, three new high molecular weight polypeptides of ~ 64.0, 48.0 and 42.0 kDa, respectively, were also revealed on immunonoblots when using this anti-olive pollen Cu,Zn SOD Ab (Fig. 4b). The distribution of the bands reacting to the customized antibody was little affected by the treatment of the pollen extracts with chaotropic agents like urea and thiourea (data not shown). The use of DTT favoured the identification of the cytosolic (14.5–15.3 kDa), peroxisomal (16.0 kDa) and chloroplastic (23.5 kDa) monomeric Cu,Zn-SOD forms when compared to the extracts run under non-reducing conditions (Fig. 4b). However, DTT failed to diminish the binding capacity of the anti-olive Cu,Zn-SOD Ab to high molecular weight bands in the range of 42.0 to 72.0 kDa, even at high concentrations. Such bands were only depleted from immunoblots when as much as 50 mM of the reducing agent tributylphosphine (TBP) was used (Fig. 4b). Given the allergenic nature of Cu,Zn-SOD (also called Ole e 5 allergen), we assessed the presence of Cu,Zn-SODs reactive to the antibody in the pollen of a panel of nine allergenic species. 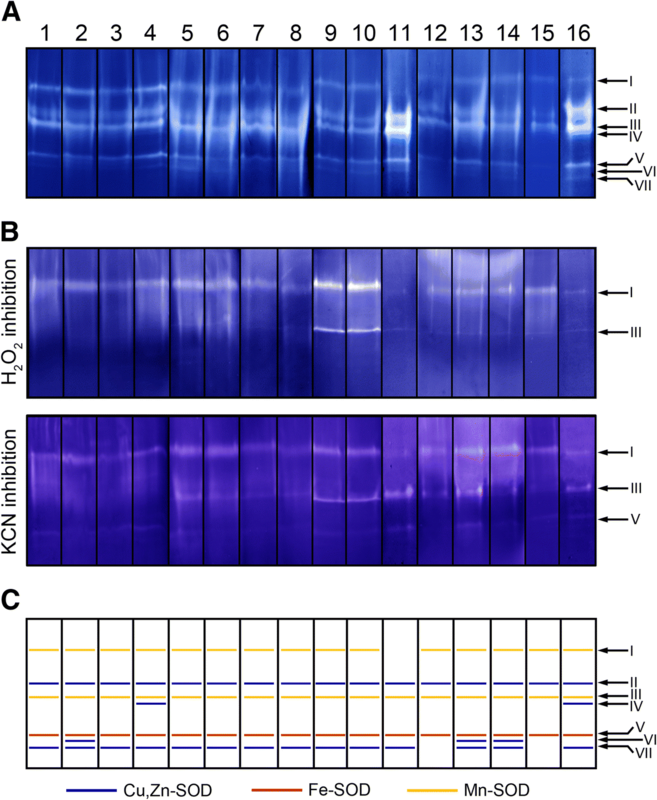 One-dimension gels displayed highly differential protein distribution patterns (Fig. 5). Using the anti-olive Cu,Zn-SOD Ab, a single cross-reactive band was detected in the different species analysed, with sizes ranging from ~ 12.0 to 15.4 kDa. A few additional immunoreactive bands, with molecular weights between ~ 18.1 and 67.4 kDa were also detected in Phleum pratense. These molecular weights might indicate the presence of multimeric forms in this species. The Chenopodium album and Dactylis glomerata pollen extracts showed very faint reactivity to the antibody. Sections of young and mature pollen grains were subjected to immunocytochemical analysis. The mature pollen stage was characterized by the presence of a fully differentiated pollen exine and a vegetative cell that completely engulfs the generative cell (Fig. 6a). At this stage, gold labelling was mainly detected in the cytoplasm of the vegetative cell and the pollen exine (Fig. 6b-c), as well as in poorly differentiated organelles, which may correspond to plastids and peroxisomes (Fig. 6c-d). Negative controls did not show any labelling (Fig. 6e). The young pollen stage was determined by the lateral position of the generative cell (Fig. 6f-g). Labelling was detected in the cytoplasm of the vegetative cell and associated with organelles, some of which were identified as plastids (amyloplasts) due to the presence of starch granules, sometimes polarized in areas of these organelles (Fig. 6h-j). The identity of the full length (OeCSD1.1A) and short (OeCSD1.1A) forms of a recombinant cytosolic Cu,Zn-SOD was confirmed by MALDI-TOF/TOF (see Additional file 3: Table S2). The molecular weights of these recombinant proteins, which were expressed as His-tag fusion proteins, were determined by SDS-PAGE to be approximately 22.1 and 21.3 kDa, respectively (Fig. 7a). In turn, theoretical molecular weights calculated from their amino acid sequences are 15,306.90 and 14,521.15 Da, respectively. Differences between theoretical and empirical Mw values are likely due to the presence of the His-tag in the recombinant forms. Additional rOeCSD1.1A and OeCSD1.1B bands of ~ 44.5 and ~ 42.8 kDa, respectively, were also observed under non reducing conditions (Fig. 7a, asterisks). These protein bands likely correspond to dimeric forms since they were removed from gels after DTT treatment. The anti-Cu/Zn-SOD antibody recognized the monomeric and dimeric forms (Fig. 7b), which were both active under non-reducing conditions (Fig. 7c). However, after reduction, only the monomeric enzyme conserved its activity. Parallel sets of native acrylamide gels including both recombinant proteins and pollen total protein extracts were subjected to SOD activity and native immunoblotting assays with the customized anti-olive Cu,Zn-SOD Ab (see Additional file 4: Figure S2). Both recombinant proteins were active, although the shorter enzyme showed lower activity levels. Moreover, a good correspondence between the activity and Ab-reacting bands in terms of number and gel position was observed. Superoxide dismutase activity in pollen was highly variable and dependent on the cultivar assayed, with values ranging from 5 to 25 U/mg protein. Pollen samples in our study were collected at the same developmental stage and on the same day, and trees of all cultivars analysed were located close to each other. Therefore, we should not expect a major influence of environmental factors over SOD activity rates, and differences among cultivars should be rather due to their distinct genetic background. Reactive oxygen species homeostasis is critical for proper pollen functioning. Thus, ROS, and particularly H2O2, participate as signals in diverse pollen-pistil interaction processes  such as self-incompatibility [7, 44, 45], as well as in events driving the polarization of the pollen tube during its apical growth [45–47]. Hence, the high rates of SOD activity observed might contribute to balance the extremely high metabolic rates of the pollen grain upon hydration and germination. Moreover, previous studies showed a direct correlation between an increase in Cu,Zn-SOD activity and tolerance to dryness in several species [48, 49]. This fact suggests that high levels of SOD activity might also protect the highly dehydrated mature pollen during its journey from the dehiscent anther to the receptive stigma. The lack of correlation between SOD activity and pollen viability in these cultivars may have different explanations. Firstly, the FCR-based viability test is based on the presence of active esterases rather than SODs . Secondly, although SODs may accumulate prior to the mature stage, their function is likely to be required at higher rates later, upon pollen hydration and during germination and pollen tube growth. The presence of up to four cytosolic Cu,Zn-SOD forms in the olive pollen (cv. ‘Picual’) was previously described after isoelectric focusing experiments . After comparison with the transcriptomic data showed here, the ~ 15.3 kDa band observed on immunoblots, and initially assigned as a single polypeptide, might indeed comprise three different cytosolic Cu,Zn-SOD forms, namely CSD1.1A, CSD1.2 and CSD1.3. These SOD forms showed very similar theoretical molecular weights ranging from 15.2 to 15.3 kDa, so that they could not be discriminated after 1-D electrophoresis (Table 1). However, 2-D electrophoretic separations allowed us to distinguish them on the basis of their distinct isoelectric points (see Additional file 2: Figure S1). An eight-aa shorter form of ~ 14.5 kDa was also identified and is discussed below. The four amino acid sequences showed 100% identity in cultivars ‘Picual’ and ‘Farga’, suggesting that these proteins might be highly conserved in the olive germplasm. Two additional Fe-SOD and Mn-SOD isoenzymes were identified in the pollen grain of this species. The presence of the corresponding transcripts was also supported by transcriptomic data (Table 1). Previous work demonstrated the expression of a Mn-SOD gene at very low levels in the pollen grain of maize . However, to our knowledge, this is the first time that Mn-SOD and Fe-SODs have been clearly demonstrated to be present at protein level in the male gametophyte. 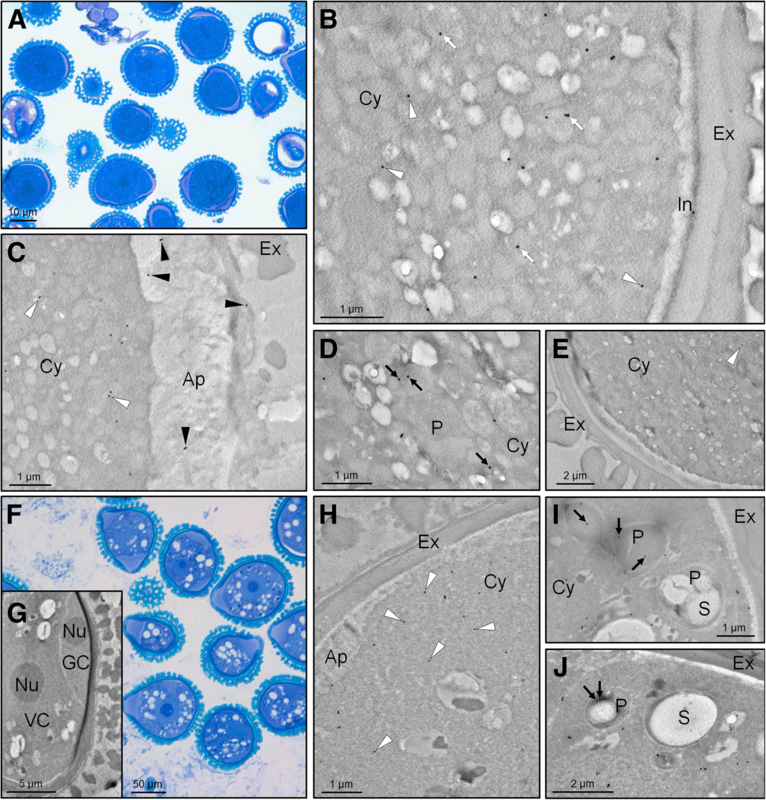 Iron-SODs are typically associated with chloroplasts , while Mn-SOD isoenzymes are present in mitochondria and peroxisomes [26, 27]. Interestingly, the cytoplasm of the vegetative cell, as well as the pollen tube in the region behind the apex, contains abundant mitochondria and plastids, both of which are involved in energy supply during pollen maturation and pollen tube growth [51, 52]. This fact suggests that pollen Mn- and Fe-SOD enzymes might be involved in ROS homeostasis in these organelles during development. Based on biochemical and transcriptomic data, we suggest that the 16.0 and 23.5 kDa bands observed on immunoblots likely correspond to monomeric forms of peroxisomal and chloroplastic Cu,Zn-SOD proteins, respectively. Frequently, those customized antibodies originally raised against cytosolic Cu,Zn-SODs may also recognize their chloroplastidic  and peroxisomal  counterparts due to high homology between both sequences. Some commercially available antibodies to cytosolic Cu,Zn-SODs have also been reported to cross-react to some degree with their chloroplastidic and peroxisomal equivalents, as it is clearly corroborated in the present work. The presence of post-translational modifications might explain the high number of spots detected on 2-D immunoblots (see Additional file 2: Figure S1), although there is no direct evidence supporting this hypothesis [54–56]. Chloroplastidic Cu,Zn-SODs were reported to be present in the thylakoid membranes of the vegetative tissues at the stromal face close to the PSI . A pioneer study carried out on SODs in mature olive pollen  failed to report the presence of chloroplastidic Cu,Zn-SOD forms. This might be explained by the fact that olive mature pollen organelles are often undifferentiated with, in many cases, plastids, mitochondria and peroxisomes being indistinguishable unless specific preparation methods or markers are used . The presence of amyloplasts, a type of plastid responsible for the synthesis and storage of starch, in mature pollen grains has been described previously by . It has been suggested that plastidial glycolysis together with mitochondrial respiration, fermentation and cytosolic glycolysis are some of the ways in which energy for the metabolism during pollen maturation and pollen tube growth is obtained . Here, we reported the localization of a Cu,Zn-SOD enzyme in subcellular structures that are compatible with plastids in mature pollen grains. At younger stages, the signal was clearly attributed to amyloplasts, which were easily recognizable by their starch content. Two partial nucleotide sequences annotated as chloroplastidic Cu,Zn-SODs were identified in the olive (cv. ‘Picual’) pollen transcriptome (Table 1). These two partial amino acid sequences overlap to generate a complete sequence that displayed 99.13% identity with a chloroplastidic Cu,Zn-SOD present in the olive (cv. ‘Farga’) genome. The cytoplasm of both the vegetative cell and the pollen tube also contain peroxisomes . A recent work unequivocally demonstrated the presence of a Cu,Zn-SOD enzyme in the olive pollen peroxisomes by co-localization experiments at TEM using a customized anti-Cu,Zn-SOD Ab and an antibody reactive to catalase, which is a peroxisomal marker enzyme . In the present study, the existence of specific peroxisomal Cu,Zn-SOD transcripts was also supported by transcriptomic data (Table 1). Thus a complete amino acid sequence showed 99.35% identity with a sequence from the olive genome (Table 1). 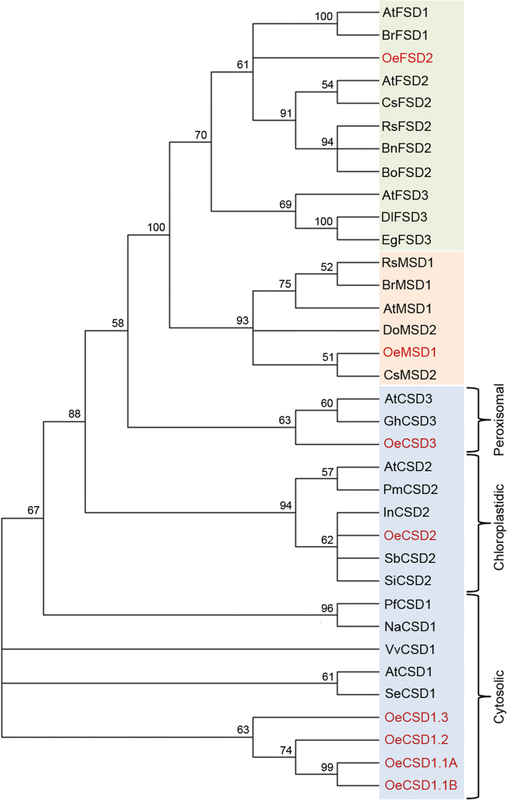 The molecular phylogenetic analysis of olive pollen SODs grouped separately Cu,Zn-, Fe and Mn-SODs in three clades (Fig. 8). Within the Cu,Zn-SOD clade, cytosolic, chloroplastidic and peroxisomal Cu,Zn-SODs were placed in separate branches, each with other similar plant Cu,Zn-SODs (Fig. 8). The high molecular weight SOD bands observed on immunoblots might correspond to multimeric forms of these enzymes. Indeed, the presence of high molecular weight SOD isoenzymes resisting treatments with reducing agents like DTT or β-mercaptoethanol has been shown repeatedly, although it has been frequently unnoticed . Other authors have described Cu,Zn-SOD enzymes as some of the most stable globular protein families studied. They maintain a stable native dimeric structure at high temperatures even under reducing conditions, due to hydrophobic interfaces, the packing of the stranded β-barrel scaffold, the presence of an intra-chain disulphide bridge and the stabilizing effect of metal cofactors . Alternatively, plant proteins other than SODs may also catalyse the disproportionation of O2 ·- radicals. This is the case of germin, a manganese containing protein, structurally equivalent to 7S seed storage proteins (vicilins) with bifunctional (oxalate oxidase and superoxide dismutase) characteristics [61, 62]. Germins are prone to aggregation forming pentamers to, more frequently, hexamers of high molecular weight [62, 63], and are unusually resistant to proteases, detergents and heat [63–65]. At least 22 transcripts were identified in olive pollen (http://reprolive.eez.csic.es/) with relevant homology to this protein (data not shown). Validation of both expression and activity of this enzyme in olive and other species is yet to be carried out. Copper,Zinc-SODs and Mn-SODs have been reported to be allergenic proteins in a variety of sources including insects (cockroaches, Drosophila), fungi (Alternaria, Aspergillus, Penicillium, Cochliobolus, Malassezia), grasses (Phleum pratense), tomato (Lycopersicon esculentum), olive (Olea europaea), rubber tree (Hevea brasilensis) and Pistacia sps. (www.allergome.org/index.php and literature therein). In this study, we analysed the presence of Ole e 5-like (Cu,Zn-SOD) allergens in a relatively large number of species documented in terms of their ability to produce allergy-eliciting pollen. We concluded that all of them carried Ole e 5-like forms, which are cross-recognized by the anti-olive Cu,Zn-SOD Ab. Ole e 5 allergen is considered to be a minor allergen of the olive pollen, which, despite its low prevalence, causes allergic symptoms and IgE and/or skin prick test (SPT) reactivity in about 35% of the population analysed that is allergic to this pollen . Cross-reactivity of the allergen among species has not yet been extensively analysed . However, on the basis of the results obtained in this study, Cu,Zn-SODs and other SOD enzymes are probably involved in the complex allergograms of the species we have analysed. To support this hypothesis, we took into account the similar molecular weights of the cross-reacting bands, the enzyme’s high conservation levels in many different sources and its rapid and easy release from pollen grains among other factors. All this needs to be further analysed using specific techniques such as SPTs, ELISA and immunoCAP techniques. One of the cytosolic Cu,Zn-SOD sequences (OeCSD1.1B) identified in the olive pollen transcriptome included an important 24 nt gap. Multiple sequences of Cu,Zn-SOD harbouring this gap have been also identified in the genome of O. europaea cv. ‘Farga’, recently sequenced and annotated , as well as in the transcriptomes generated from leaf, root and fruit tissues . We suggest that this shorter Cu,Zn-SOD form could be the result of an alternative splicing event (Fig. 7d-e). Following further in silico structural analysis, we were able to predict that the resulting gene products may be both active enzymes. Thus, the functionality of the CSD1.1B sequence assembled after NGS and that cloned by the authors, was unlikely to be greatly affected, as neither the reading frame nor the presence of key amino acids was disturbed. Accordingly, the heterologous expression of the OeCSD1.1A and OeCSD1.1B enzymes resulted, in both cases, in proper folding to at least a certain degree, though in a small proportion of both proteins, as demonstrated by the detection of SOD activity in both expressed forms. Noticeably, the full lenght SOD enzyme showed higher levels of activity than the shorter one. Therefore, it is possible that the removal of the 8-AA fragment not only slightly affected the molecular weight and isoelectric point of the protein but it might also lead to subtle changes in its activity and/or kinetics. We also observed the spontaneous appearance of low amounts of dimeric forms of the recombinant proteins, very likely through the formation of intermolecular disulphide bridges. Interestingly, both the monomeric and dimeric enzymes were shown to be active on native gels. On the other hand, the stability of the recombinant enzymes was very low. Thus, no reproducible results were obtained when spectrophotometric assays of SOD activity were carried out (data not shown). Characteristics such as instability and loss of activity have been widely described for monomeric forms [69–72]. Other factors including the lack of adequate concentrations of the ions needed for proper folding might have also led to the loss of protein stability. Thus, the Zn atom has been reported to directly influence the Cu site by modifying its reduction potential and geometry . The negative charge at physiological pH has also been linked to Cu,Zn-SOD stability . Further improvements in the production of these proteins should enable the differential properties of these enzyme forms to be tested. The absence of the described peptide in the shorter form of the protein might also affect its antigenic and allergenic properties, as the short missing sequence has been predicted to take part of different T- and B- epitopes . This should be further investigated as well, due to the relevant properties of the protein as allergen (Ole e 5). The olive pollen grain contains a full set of SOD enzymes, including cytosolic, plastidial and peroxisomal Cu,Zn-SOD forms, as well as Mn- and Fe-SOD isoenzymes. In addition, we identified a less abundant 8 aa-shorter Cu,Zn-SOD form (likely the product of an alternative splicing event), which is fully functional. Interestingly, the level of SOD activity is cultivar-dependent, probably as a consequence of the intrinsic genetic variability of the olive tree germplasm. The presence of this versatile enzymatic battery and the high levels of SOD activity detected in the pollen grain, together with the plethora of other antioxidant enzymes and factors responsable for maintaining the structure of macromolecules and membranes, might confer it resistance to desiccation and other adverse environmental factors during its journey from the dehiscent anther to the receptive stigma, and might also respond to the necessity of finely regulating the ROS homeostasis during the period of highly active metabolism that follows its germination. Mature pollen samples from 16 different olive (Olea europaea L.) cultivars were obtained from trees of the germplasm collection at C.I.F.A. Venta del Llano (Mengíbar, Jaén, Spain). Pollen samples were collected in paper bags by vigorously shaking the olive inflorescences, sieved through 150 and 50 μm mesh nylon filters to remove debris, and then stored at − 80 °C. Mature pollen samples from Parietaria judaica, Salsola kali, Phleum pratense, Artemisia vulgaris, Platanus hybrida, Chenopodium album, Plantago lanceolata, Festuca pratensis and Dactylis glomerata were provided by Inmunal SAU (Madrid, Spain). Pollen viability was assayed using fluorescein diacetate (Sigma, USA) as described by . Observations were carried out under an Axioplan fluorescence microscope (Zeiss, Germany) equipped with a ProGres C3 CCD camera, using the ProGres CapturePro 2.6 software (Jenoptik AG, Germany). At least 1000 pollen grains per cultivar, corresponding to three independent biological replicas, were counted. Pollen protein extracts from 16 olive varieties were prepared by stirring 0.1 g of material in 1.5 ml of extracting buffer [50 mM phosphate buffer (pH 7.8) and 1 mM phenylmethylsulfonyl fluoride (PMSF)] for 4 h at 4 °C. Samples were centrifuged at 12,000 g for 20 min at 4 °C, and the supernatants were sieved through a 0.22 μm filter (MillexGP, Millipore, USA) and stored at − 20 °C until use. For 2-DE, protein extracts from ‘Picual’ and ‘Arbequina’ pollen samples were prepared as described before . Pollen protein extracts from allergenic plant species were obtained by stirring 0.1 g of material in 2.5 ml of extracting buffer [40 mM Tris-HCl (pH 7.0), 2% (v/v) Triton X-100, 60 mM dithiothreitol (DTT) and 10 μl of protease inhibitor cocktail (Sigma)] for 2 h at 4 °C. Protein extracts were desalted using PD-10 columns (GE Healthcare Biosciences AB, Sweden) and concentrated with 20% (w/v) trichloroacetic acid (TCA) in chilled acetone overnight. Samples were centrifuged at 10,000 g for 30 min at 4 °C, and pellets were resuspended in 40 mM Tris-HCl (pH 8.8). Assessment of the effects of reducing and denaturing agents on multimeric SODs was performed by incubating pollen extracts with DTT (50–200 mM) or tributylphosphine (TBP) (5–50 mM), and urea (3.5 M) and/or thiourea (1 M), respectively, prior to electrophoresis. All protein extracts were quantified using the 2D Quant Kit (Amersham Biosciences, UK) according to the manufacturer’s instructions. Total SOD activity of protein extracts was assayed in vitro according to the method of . One unit (U) of SOD activity was defined as the amount of enzyme that inhibits the rate of reduction of cytochrome c by 50% in a coupled system, using xanthine and xanthine oxidase, at pH 7.8 and 25 °C. All activity assays were performed in triplicate. Pollen SOD isoenzymes were separated by native PAGE on 15% polyacrylamide gels using a Hoefer electrophoresis unit SE 600 series (Amersham Pharmacia Biotech, UK), and their activity was visualized as described by . Approximately 375 μg of total protein was loaded per lane. Parallel native PAGE gels were also incubated in the reaction buffer [5 mM H2O2 or 2 mM KCN] for 20 min in the dark before SOD activity detection as above. These experiments were done in duplicate. Two olive pollen sequences (accession no. EU250770.1 and EU250769.1), representative of the full length and 8 aa-shorter OeCSD1.1 forms, respectively, were used to generate the recombinant proteins (see Additional file 5: Figure S3). 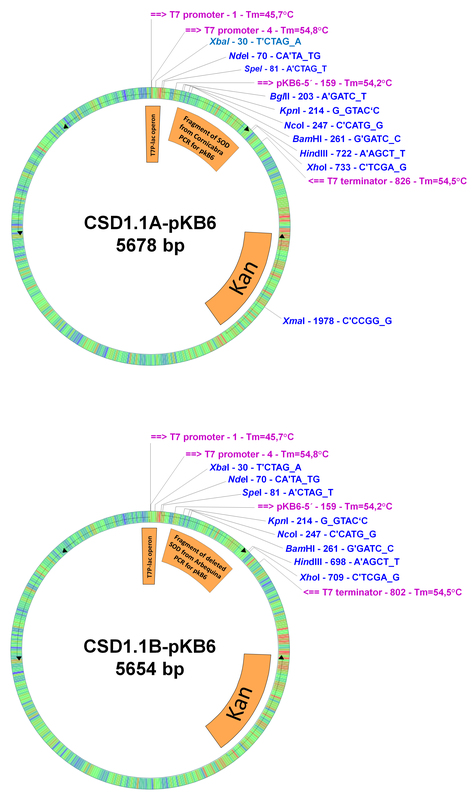 Both sequences were cloned into the pKB6 vector (Rekom Biotech SL, Spain) to generate the constructs SODc-pKB6 and SODd-pKB6 (see Additional file 6: Figure S4). 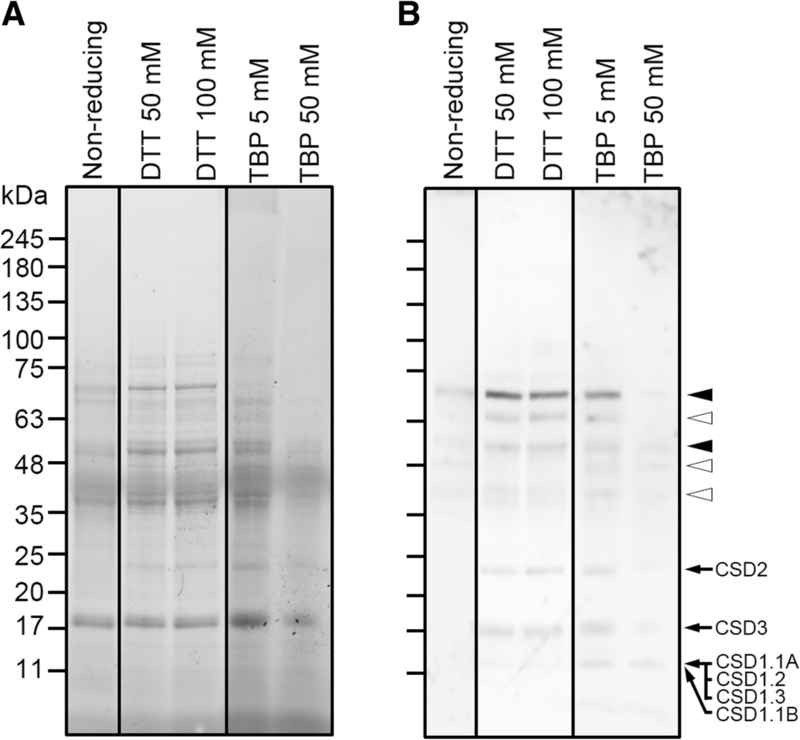 Both proteins were expressed in E. coli (Rosetta BL21 pLysS strain) grown at 37 °C, after induction with 1 mM isopropil-β-D-1-thiogalactopyranoside (IPTG) for 2 h. Recombinant SODs were captured using a Ni Sepharose 6 Fast Flow resin (GE Healthcare Biosciences) by affinity chromatography to the His tag fused to the N-terminus of each protein. Recovered protein solutions were further refined and concentrated by anion exchange chromatography (Q Sepharose™ Fast Flow, GE Healthcare Biosciences) and microfiltration using an Acrodisc® Syringe Filter 0,2 μm HT Tuffryn® low protein binding membrane (Pall Corporation, USA). Recombinant proteins were quantified at 280 nm, using the theoretical extinction coefficient , and stored at − 80 °C in 20 mM sodium phosphate (pH 8.0) and 1 M NaCl until use. The identity of recombinant SOD enzymes was confirmed by MALDI-TOF/TOF MS analysis at the Proteomic Facilities of the López-Neyra Institute of Parasitology and Biomedicine (CSIC, Granada, Spain). Briefly, proteins were reduced, alkylated and enzymatically digested following standard procedures. Tryptic digests (1 μl) were mixed with a matrix solution (1 μl) of α-cyano-4-hydroxycinnamic acid (CHCA), and applied to an AnchorChip target plate (Bruker-Daltonics, Billerica, Massachusetts, USA). MS spectra were obtained using an Ultraflex Xtreme MALDI-TOF/TOF mass spectrometer (Bruker-Daltonics) using Flex Control v3.4 software (Bruker-Daltonics), and processed by ProteinScape v3.1.3 software (Bruker-Daltonics). The spectrometer was externally calibrated using the Peptide Calibration Standard mixture (Bruker). The peptide mass fingerprint (PMF) search was performed against the ReprOlive database (21,607 sequences, 3,557,391 residues;  using MASCOT 2.4.0 software (Matrix Science, UK) integrated with ProteinScape software (Bruker-Daltonics, Germany). An error of less than 50 ppm on the parent ion mass was tolerated. One missed cleavage per peptide was allowed, and carbamidomethylation for Cys as fixed variable and oxidation for Met as variable modification were set. There were no constrains with respect to protein Mw and pI. The signal to noise threshold ratio was set to 3. The significance threshold was set at bp 0.05. NanoLC-MS/MS analyses of excised bands from SOD activity gels were performed on a nanoACQUITY Ultra Performance LC® System (UPLC®) coupled to a quadrupole time-of-flight mass spectrometer (maXis; Bruker Daltonics) equipped with a nano-electrospray source. Mass data were searched using a local Mascot server (v2.4.0; MatrixScience) against Viridiplantae database (Taxonomy ID 33090). Searches were performed without any Mw or pI restrictions and carbamidomethylation for Cys and oxidation for Met were set as variable modifications. Mass tolerances on precursor and fragment ions of 20 ppm and 0.07 Da were set, respectively. Mascot (.dat) results were filtered to evaluate the false discovery rate . Protein identification was confirmed when at least two peptides with high-quality MS/MS spectra (less than 10 points below Mascot’s threshold score of identity at a 95% confidence level) were identified. This threshold led to protein identification with a false discovery rate of less than 1.5%. 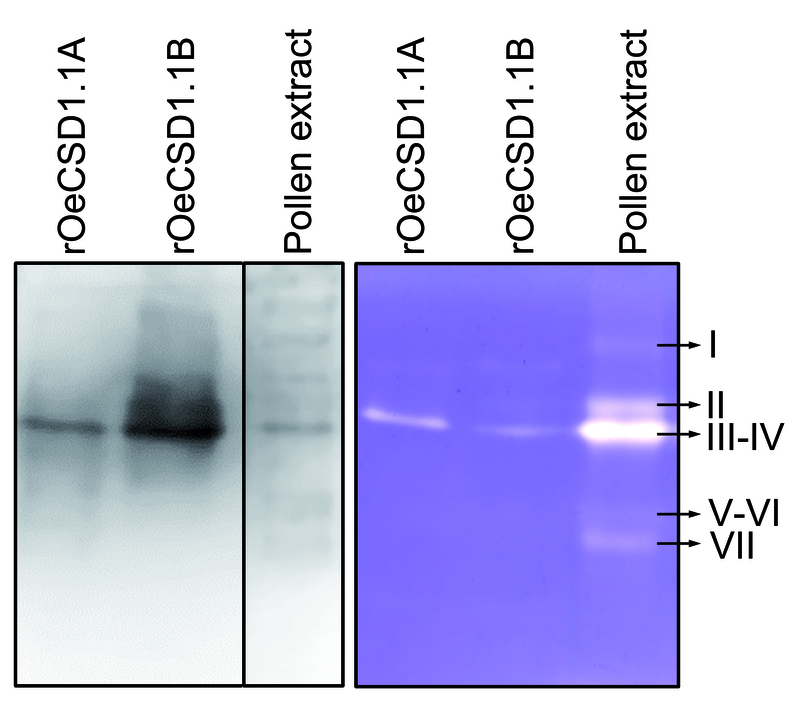 The polyclonal antibody against the olive pollen Cu,Zn-SOD was generated in two different rabbits after immunization with the whole recombinant OeCSD1.1.B protein (accession no. EU250769.1) by Davids Biotechnologie (Germany). Specificity of this antibody was further established by comparing its reactivity with that of an anti-CSD2 (Arabidopsis thaliana chloroplastidic Cu,Zn-SOD; At2g28190) antibody (Agrisera, Sweden). Proteins were separated and electroblotted using the stain-free technology (Bio-Rad) according to the manufacturer’s instructions. After blotting, polyvinylidene fluoride (PVDF) membranes were blocked with 10% (w/v) defatted milk for 1 h, and incubated with the anti-Cu/Zn SOD Ab (diluted 1/5000) for 12 h at 4 °C. Immunodetection was performed using an anti-rabbit IgG Ab conjugated with Alexa Fluor 532 (Molecular Probes, UK) (diluted 1/10,000) for 1 h. Protein bands were visualized in a Pharos FX system (Bio-Rad, USA) and molecular weights were calculated using the Quantity One Software v.4.6.2 (Bio-Rad). All experiments were performed in duplicate. Rehydration of 11 cm IPG strips (pH 3–10 NL, BioRad), including the sample (200 μg of total protein) in the rehydration buffer, was performed overnight. Isoelectric focusing (IEF) was carried out at 20 °C in an Ettan IPGphor IEF apparatus (Amersham Biosciences) as follows: 300 V for 1 min, 1000 V for 10 min, 8000 V for 90 min and finally a total of 30 kVh. The reduction and alkylation steps were performed as previously described . The second dimension was carried out in a Criterion™ Cell (Bio-Rad) and gels were stained with Coomassie brilliant blue (CBB). Immunoblotting was carried out in parallel as described above. Mature pollen grains from cv. ‘Picual’ were fixed with 4% (w/v) paraformaldehyde and 0.2% (v/v) glutaraldehyde in 0.1 M cacodylate buffer (pH 7.2) for 24 h at 4 °C. Samples were dehydrated throughout an ethanol series, and embedded in Unicryl resin (BBInternational, UK). Ultra-thin (70 nm) sections were obtained using a Reichert-Jung Ultracut E microtome (Leica Microsystems, Germany) and mounted on Formvar-coated 200 mesh nickel grids. For immunolocalization, sections were blocked with 1% (w/v) bovine serum albumin (BSA) in PBS solution for 1 h, followed by incubation with the anti-Cu/Zn SOD antibody (diluted 1/200) at 4 °C overnight. After three washes of 5 min each with PBS, sections were incubated with an anti-rabbit IgG-30 nm gold-conjugated Ab (BBInternational) (diluted 1/50 in PBS containing 2% BSA). Finally, sections were contrasted with 5% (v/v) uranyl acetate for 20 min and examined under a JEM-1011 electron microscope (JEOL, Japan). The alignment of nucleotide sequences was performed by using the Clustal W software (http://www.ebi.ac.uk/Tools/clustalw/). A phylogenetic tree of all SOD amino acid sequences from olive pollen and Arabidopsis thaliana was constructed in MEGA 7.0 by the maximum likelihood (ML) method . 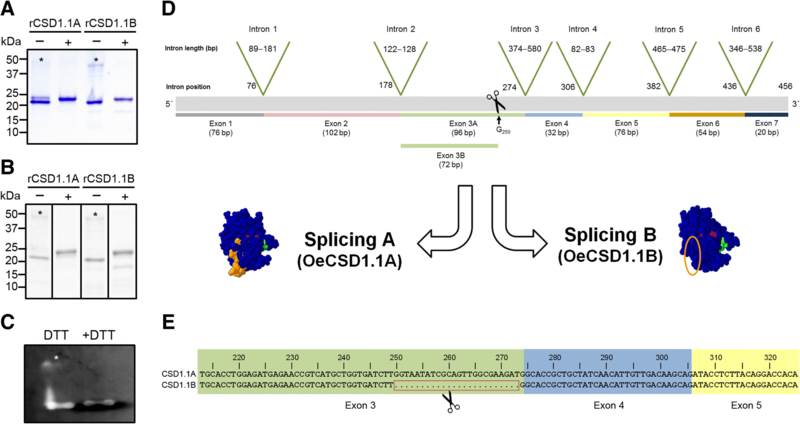 The splicing A and B forms of OeCSD1.1 were subjected to 3D reconstruction (http://swissmodel.expasy.org/workspace/)  by using the 2q21 template (annotated as a dimer) available as PDB by means of the DeepView v3.7 software. Search of olive SOD genomic sequences was performed using the BLAST tool as described by . The Kolmogorov-Smirnov test was used to test the normality of SOD activity and pollen viability data. An ANOVA analysis was performed to assess differences in both SOD activities and pollen viability among cultivars. Pollen SOD activity levels and viability were also compared using ‘Picual’ as the reference cultivar. Statistical comparisons were carried out using the Student’ s t test at a significance level of p < 0.01. The Levene’s test was applied to assessed the equality of variances. The Pearson test was carried out in order to determine whether SOD activity and pollen viability variables were correlated. All analyses were performed using SPSS v.23 software (IBM, USA). The authors would like to thank Drs. Jose Manuel Palma, Javier Corpas and Eduardo López-Huertas (EEZ-CSIC, Granada, Spain) for their support and advice with regard to the characterization of SOD activities. The English text was corrected by Michael O’Shea. This study was supported by ERDF-cofunded projects BFU2011–22779, BFU2016–77243-P and RTC-2015-4181-2, RTC-2016-4824-2 (MINECO), P2010-AGR-6274, P10-CVI-6075 and P2011-CVI-7487 (Junta de Andalucía) and 201540E065, 201840E055 (CSIC). AZ thanks the JAE-CSIC program and the Agrifood Campus of International Excellence ceiA3 for the grant funding kindly provided. We acknowledge support of the publication fee by the CSIC Open Access Publication Support Initiative through its Unit of Information Resources for Research (URICI). All SOD sequences reported in this study are available in the GenBank database (https://www.ncbi.nlm.nih.gov/genbank/). AZ, JDA, and AJC were involved in the design of the experiments, interpretation of the results and redaction of the manuscript. AZ performed the experiments. All authors have read and approved publication of the present manuscript. The present manuscript does not contain potentially-identifying information of patients/participants needed of consent for publication.